So the Olympics are over. Here are some reflections. First, ‘way to go’ Kiwis! Awesome job! As an old man indoor-rower, I especially loved watching Cohen, Sullivan, Bond, Murray, Drysdales and the others smash the world. Lisa Carrington’s win was brilliant. While others were disappointed, Valerie Vili remains a superstar with her silver, beaten on the day by a better thrower. Not to mention our sailors Jo Aley and Polly Powrie, Sarah Walker, etc; and of course Mark Todd—what a legend. He gives hope to my generation, although a come-back is only possible if you have already been there! And Nick Willis will always be a hero for me despite not having his best day in the final. We see in these athletes the best of being Kiwi—humility, guts, resilience, overcoming the odds, determination, courage and beating a much bigger world. Secondly, I am intrigued that all of our golds were won sitting down either in a boat or on a bike. Does that reflect that NZers like sitting on their buttocks? Is that what we do best? If it is, we may as well exercise as we do so. It would be good to get some medals standing or swimming in the future though. Thirdly, we rocked by population. We came fifth by total medals per population, behind Caribbean countries, Grenada, Jamaica, Trinidad-Tobago, and the Bahamas. For gold medals, we were fourth, behind the same countries except Trinidad-Tobago. We were way ahead of Australia, USA, and China. We may be a flightless bird, but we are a good one. Fourthly, I love the way the Olympics reflects the ideals of the Kingdom of God. It is great to see a disabled man Oscar Pistorius and women from such countries as Saudi Arabia competing—the Olympics should be about the breaking down of social boundaries in this way. I love the picture we get of humanity coming together as one, not for war or power-games, but to celebrate being human, to compete and to celebrate. Of course the ideal is not complete with inequalities masked, with much excessive consumption, licentiousness, nationalism, drug abuse and more—but we do get a glimpse of the dream of the Kingdom of God whereby all of humanity will ultimately be one. This gives me hope and spurs me on toward that final goal. Fifthly, I continue to be intrigued by the many displays of overt religiosity by athletes. While many hate them, I love them. They show that faith is alive and well in our secular world, and that faith cannot and won’t be banished to the margins. Many, especially Africans, were seen genuflecting. Many when interviewed gave thanks to God. I especially enjoyed Lucy Van Dalen’s genuine comments about her relationship with God. I know from my daughter Annie, who runs with Lucy in the USA, that Lucy has a genuine and deep relationship with God. 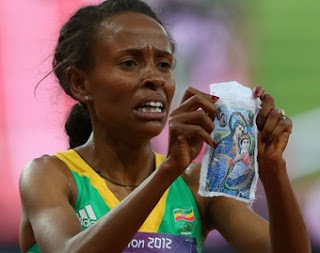 My favourite moment was Meseret Dafar, full of deep emotion, holding a picture of Mary and Jesus, when she won the 5000m. While some Protestants might feel a little uncomfortable, who can deny her genuine faith in God? Glorious. Finally, I suppose it is back to the same old same old sport and TV. It has been great seeing rowing, handball, synchronised swimming, athletics, BMX, etc; rather than the usual diet of rugby, league and the NZ cricket team. Now it is back to Coronation Street, endless repeats of ‘Friends,’ and “super rugby. Bring on Rio.